Ok, might as well make a personal thread instead of keeping on posting related questions all over the place. 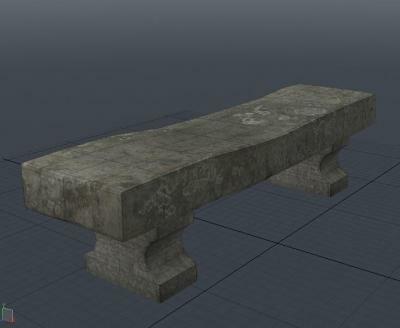 Made this bench yesterday night, and even though I have created some simple normal map conversions for previous tests already, Im yet to make a proper one for a texture I painted by hand like this one. Since Im unable to test them in game for the moment, what would you guys suggest for a very subtle, matte finish for an unpolished granite texture? The thing about some of the existing models is that the bump maps are a bit big in proportion to objects; also, the grain here should scarcely be visible, more like a "rough", sanded surface rather than polished areas filled with small holes. Edited by RPGista, 03 July 2012 - 09:03 AM. If this bench by some stroke of luck finds its way into 1.08, I for one will use it immediately. 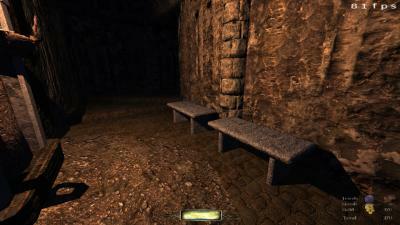 I have a half-dozen brush/patch concrete benches in use in my WIP, but this new bench blows 'em away. Yes, it's very nice. I'd just make a very subtle normalmap from a greyscale version of the diffuse, personally. I would gadly donate the model to be used in your upcoming mission - just need to make sure there are no problems with it (specially smooth groups issues), work on that subtle normal maps as Springheel suggested and look into the whole process of making the collision and shadow models, and putting that into the game. I have a garden in my FM that your bench would be perfect for. How many polys is it? It probably doesn't need either a shadowmesh or a cm. Just triangulated it and it seems to have 1074 polygons in total? It looks very old and worn, very pretty, just what the mod needs. Bit high for a bench, but I suppose there is a lot of beveling. Probably does need a shadowmesh and cm then. You could make a cm that's under 30 polys, and shadowmesh that's under 200. Shouldnt be too hard, since I kept the different stages of the model in separated files. 1074 polys seems to be way too much for that. If you'd just remove the red edges that I've marked for you here you should be able to easily shave off a couple hundred tris without any discernable difference (remember that it's only the silhouette that's important). If you were to bake from a highpoly you could easily fake the bevels with the normalmap and save even more polys. All you'd need for that would be a smoothed highpoly version of this and a cage and you'd be all set. Make a highpoly. All you'd need to do for this is apply some kind of subdivision surface effect (smoothing) on the older highpoly model that you posted the render of (you'd want this one as it doesn't seem to have any triangles or n-gons only quads). Optimize the lowpoly by removing the bevels at the ~90 degree angles and instead make these angles sharp (in Blender you'd mark them as sharp, in Max and Maya you'd use smoothing groups, if nothing else you can just split the edges). You might also want to separate the UV-islands at the sharp angles as it might make it look better. Make a cage for the lowpoly (this will then be used for instructing xNormal how it should render the texture). This is just the same as the lowpoly model just scaled up along the normals to completely encompass the highpoly. This mesh need to have the exact same topology and amount of vertices as the lowpoly model). Export all these parts (highpoly, lowpoly and cage) as OBJ or FBX. Import these into xNormal and bake your maps (I'd recommend Normal, Ambient Occlusion, Cavity, Ray Fails [so that you can clearly see if your cage misses something] and Curvature maps). Combine the maps in Photoshop or Gimp (you could multiply the AO and cavity maps and then play around with the blue channel [edge highlights] of the curvature maps). Nosslak - thanks a lot for all this info, but Im afraid a lot of that is too advanced for me right now. I'll surely keep this for reference in the near future, but with this one I think I'll stick to the simplest way as it gives me enough problems already! Will definetely use this for more advanced models. The problem right now is that I cant test this ingame (and release it) because I have no way of exporting to ASE... (Is Serpentine MIA? If anyone have the previous Assimp exporter version, please upload it for me). Modo can export to LWO, but Im not so sure how to put those in the game? Is it the same process, editting the file manually to find the materials shaders? Edited by RPGista, 07 July 2012 - 07:13 AM. Modo can export to LWO, but Im not so sure how to put those in the game? 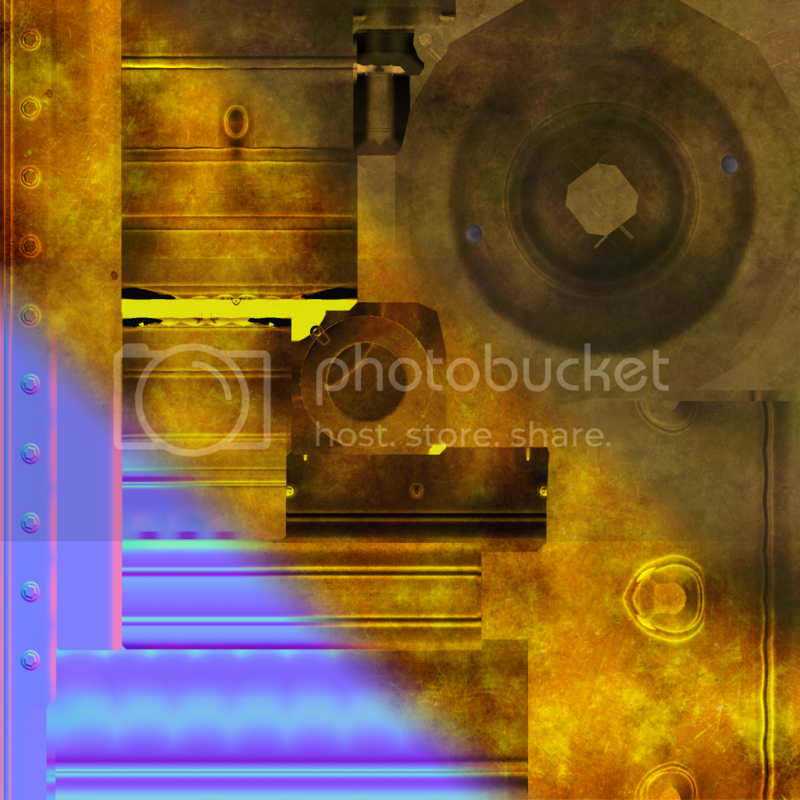 Is it the same process, editting the file manually to find the materials shaders? Exporting to .lwo is easier than .ase. You don't have to edit the material shaders. Just make sure the surface name of the mesh is the name of the shader. I'll probably have to (learn and) create the shadow mesh, but I put 4 of them in this test map, with 3 light sources (moon, two fires, probably also an ambient), plus a bunch of other models around (in the background), and didnt notice any drop in the fps, so Im guessing its not going to be that much of a problem. Edited by RPGista, 10 July 2012 - 10:29 AM. That looks like a very good model. The texture looks a bit low-res to me, tho. Otherwise a fine model. I'd still go for the shadow and CM mesh, tho, as these can really matter on low-end systems (or when you put 10 of these benches on a plaza). Would you also be able to make a low-poly model? 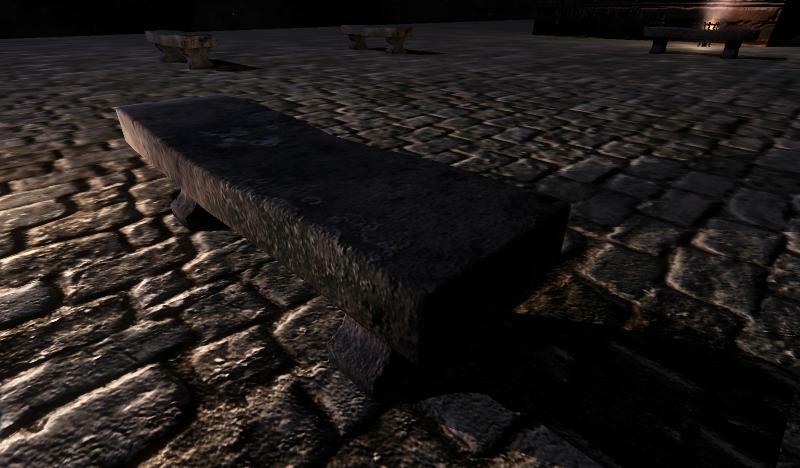 (You could re-use this as the shadow mesh, too) That way we can set it up for LOD. 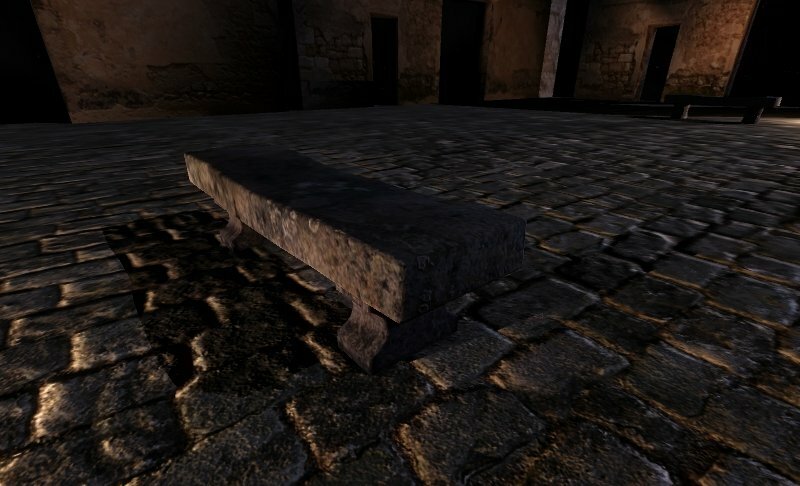 Made a second bench with tweaked texture and a more regular shape (no depression on the top piece) to allow for some more variety, then on to shadow mesh/low poly version (its about 864 polys right now, by the way). Have to remember to set the skins to no self shadows... I wouldnt want to spend too much work on any one model, its more about unique, varied objects and finding the right way to use them, for me. Edited by RPGista, 10 July 2012 - 05:48 PM. It has 352 tris, hopefully this will be enough for most situations, as simplifying any further would mean laboriously retracing of the orginal shape with new solids. If Grayman is ok with it (=if he doesnt plan on using loads of then in the same room), I'd probably release this. Scale everything slightly (a test showed that sitting AI are floating a bit). Actually create the shadow mesh - not sure how to proceed exactly. 1- Should I keep the shadow mesh inside the model in another layer, with its own unwrap map poiting to the shadow mesh texture in the ASE path? What if it were to be a LWO model? 2- How to make the actual model no-shadow by default? Is that done at the level of the material it uses? Edited by RPGista, 12 July 2012 - 10:52 AM. If Grayman is ok with it (=if he doesnt plan on using loads of then in the same room), I'd probably release this. I have one spot where two sit side-by-side, then 4 others sit by themselves in other rooms, so I'd be happy to replace my own benches (brush + patch) with these. Edit: Here's the one spot where two are placed. When I have seen the shadow mesh used on existing models it seems to be a low poly clone of the original model - I've done a basic aproximation of your model in DR so you get the idea. That's way too much for a shadowmesh for something like this. You don't need any beveling on the edges of the seat. Just create a new rectangular solid that fits inside the seat shape. edit: Bikerdude's example is a good one. 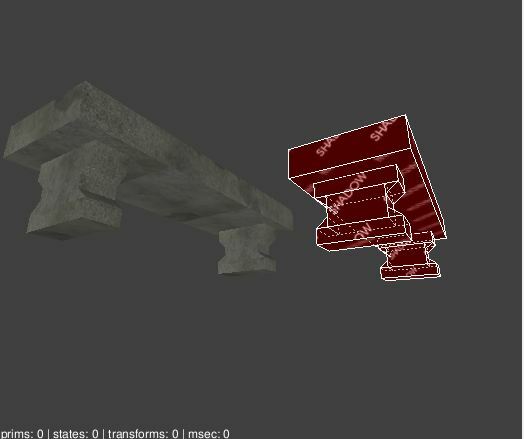 I'm not sure what "layer" means in Blender, but in LW models have to be all in one layer to render properly in D3. You just need the shadowmesh to be its own submesh, pointing to the "textures/common/shadow" texture. The uv-map for that submesh can be as messy as you like. 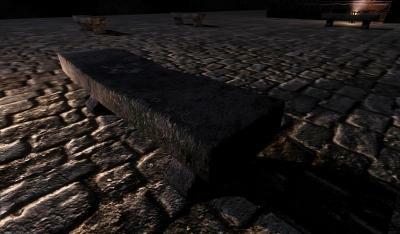 Yes, you just need to add the "noshadows" keyword to the material shader. * a set of (fairly hires) lichen-decals. Then we can make different skins for the bench, or bench-prefabs or whatever. We also could apply these stains to other textures. Right now baking the stains in means you get one good-looking bench, but put 2 next to each other and it looks repetitive.